This queen size high bed not only looks elegant but also converts unused space into an under-bed dresser! A sturdy frame and platform support contain the mattress, thus eliminating the need for that space-wasting box spring. The spacious drawers, six per side, use ball bearing drawer slides to ensure smooth and long lasting operation. 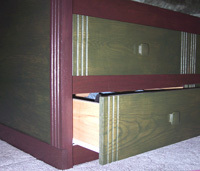 Drawers are constructed using dado/rabbet joinery. The bed is built using plywood and hardwood products and incorporates simple joinery techniques. Most of the fastening for the bed assembly uses corner zinc braces and screws, thus allowing for easy assembly/disassembly. We'll show you how to easily create the simple fluted lines and dentil trim that adorn this piece of furniture. This bed will accommodate a queen size mattress in the range of 60" by 80". Note that extra space around the mattress is allotted for bedding. The bed has a mattress height of approx. 29" when using a 6 1/2" thick mattress. Finish used for this project: Minwax Accents water-based stain, Olive Green and Vintage Burgundy, protected with Flecto Varathane Diamond Wood Finish, in a satin sheen. 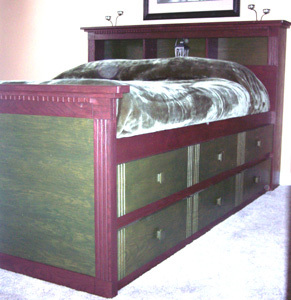 Overall dimensions: 71" wide by 91 3/4" long and 49 1/2" high at headboard, 24" high at bed rail, 31 1/2" high at footboard.